US row crop markets are higher across the board this morning as high level talks take place between the US and China per China’s commerce department. Soybeans are leading the way higher on this news as January beans make a run at 900. Futures prices attempted to touch that level but have been thwarted, last trade being 893. October highs of 905 are in view with a cup and handle technical formation in place. December corn is following in tow as prices go back to their safe space near 370. Wheat futures are rebounding as well, led by Chicago as December futures trade 508. KC wheat is the dog of dogs right now, it just can’t seem to get any bullish action. Dec KC futures trade 25 (!) under Chicago as VSR has wheat spreaders adjusting positions. Cotton remains in consolidation mode at 76.60, up slightly this morning. USDA exports are delayed one day this week due to Vets day on Monday. Soybeans are feeling optimistic this morning as I mentioned above as reports surface last night from Reuters that Chinese and U.S. officials are maintaining close contact, which is nice to hear given the lack of communication in October. Sources from Reuters say the Chinese have responded to the US IP and trade deficit concerns, but there is nothing in the report that talks about whether or not the US approved of the language. Basically, it sounds like we have arrived at the point in the negotiations where China is trying to do something to appease the US. It doesn’t sound like there are attempts to close a deal, more likely the result of the latest talks could be to inspire President Trump and the US to drop current and future tariffs in good faith which would move toward a deal. Trading this is very difficult and one misstep can be hurt but I think producers with bushels in storage that need to clear soon should be looking at taking 900-905 in January or at least look at some downside put hedges via March options. 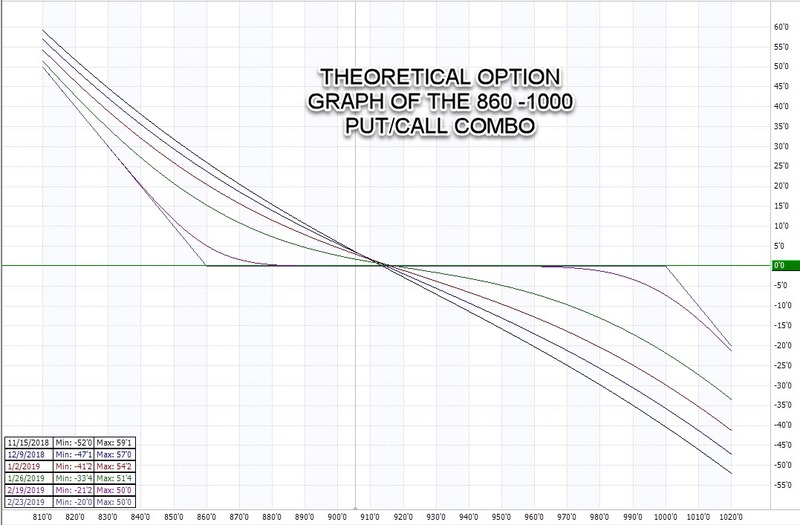 Look at something like a shorting a March 1000 call and buying a March 860 put for even money. I wouldn’t sell the call on every bushel you own, but a floor at 860 this spring could be decent given the chaos that will ensue if there is no deal and Brazil has a new crop to sell to the Chinese. NOPA crush is out later this morning. Saudi Arabia this is seeking 475,000 MTs of high pro for Jan-Mar delivery. US wheat is competitive on a fob basis, and is nearing parity with Black Sea origin on a C&F basis for Feb/Mar. The value of this tender will do a lot to inspire price action in the KC. The real issue for Saudi Arabia if it chooses Russian offers is the risk of Russian government intervention given what is going on with Iran. Tomorrow we should know the result of this. 475KMT is a lot of wheat, price discovery will be fascinating especially if US wheat makes the cut. Meantime, front month SRW basis remains strong. You can sell Dec Chicago wheat for more expensive than March delivery for KC. You would think bullish news from this tender could snap that spread back in place in a hurry. Cotton is not seeing the same love from the China news as soybeans are. Maybe this should be telling bean traders something. Demand reports out tomorrow should be telling. 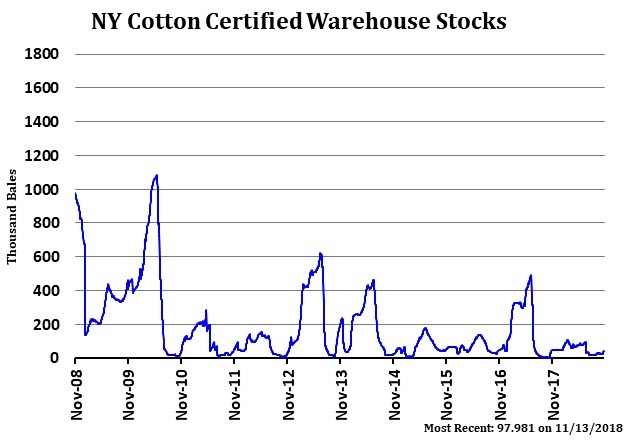 Warehouse stocks are climbing, they now sit at 97k bales, up from 50 k bales early this month. Export pace has slowed to a crawl since late September. Supply is dire though, producers in West Texas are looking at a cotton crop sitting under multiple inches of snow right now. New crop futures sit at 77 cents while the old crop carry becomes wider. At this point buying makes little sense, wait until next week when the seasonal starts and the sell recs end. This article originally appeared in the This Week in Grain (T.W.I.G.) Newsletter “Thursday Morning in Grain and Oilseeds 11/15” at 11/15/18 07:31:41 AM CT.